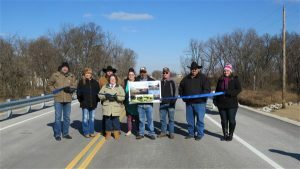 A ribbon cutting was held on January 3 to celebrate the opening of Bridge #76 over Purgatory Creek. 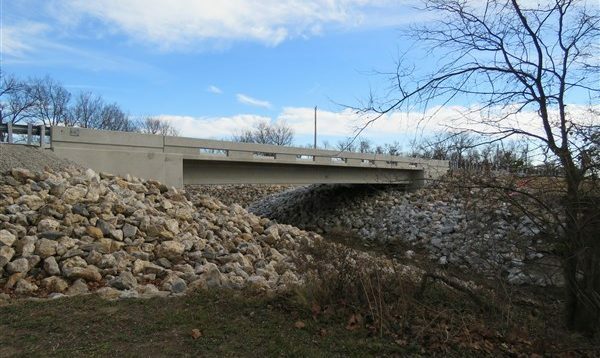 The bridge is in Nowata County District 1, led by Commissioner Curtis Barnes. It is located just north of the intersection of NS 406 and EW 25, approximately 2.0 miles east of the Nowata/Washington County line and 3.75 miles south of US-60. The old Bridge #76, built in 1932, consisted of two 18ft I-beam spans and was structurally deficient. The new bridge is a 75ft long and 26ft wide single-span PC Beam bridge with 975ft of approach roadway. It was designed by GUY Engineering and constructed by B&B Bridge Company. Funding for the bridge was provided through the County Improvements for Roads and Bridges (state funding).